Famous two-piece, stainless steel, dripless pouring valves are sanitary and easy to use and maintain. Large, 5 gallon bowls, with easy to read measuring marks, are separate to allow bowl cleaning and flavor changes without “total system shut-down”. Second-to-none quality with “field condition” testing. 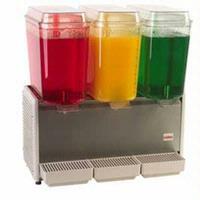 Agitators are included with each unit for fresh juices, coffees or teas.